Chinese Whispers has got nothing on Anglican spin. You know how it goes: the Archbishop of Canterbury makes a statement; it is announced verbatim by Lambeth Palace; reported with variations by sundry newspapers; gossiped about on anxious blogs; tweeted with significant misinformation by an impatient tweeple, or deliberately spun by mischievous participants to ensure that what the Archbishop is reported as saying (or doing) bears little resemblance to what he actually said (or did). The propagation of disinformation by non-Christians ought to come as no surprise, but from Christians it is a malignant distortion; a misrepresentative falsehood in the pursuit of a preferred agenda; or ‘truthiness’: “We’re not talking about truth, we’re talking about something that seems like truth – the truth we want to exist,” as expounded by American television comedian Stephen Colbert. The Rev’d Dr Christopher Craig Brittain has written an excellent piece for ABC’s Religion & Ethics blog on this precise phenomenon which merits a much wider readership. It has (at the time of writing) attracted zero comments, but it raises such important matters of communication ethics in the Anglican Communion that one is tempted to light the touch paper by reproducing the entire article and then passively watch the celestial illumination. Fuelling this emerging stand-off is a tendency to exaggerate the shortcomings of one’s opponent, to the point of engaging in character assassination. The internet has become a powerful tool in this rhetorical battle, but with the consequence that truth is often being compromised for truthiness. ..It not so much that a great many people are lying in the media; rather, an increasing number of people are becoming unconcerned with verifying their claims or with questioning the accuracy of statements by people who seem to share their own biases. In other words, “If it sounds right, it must be correct.” Exaggeration and leaving out inconvenient detail are often the order of the day. 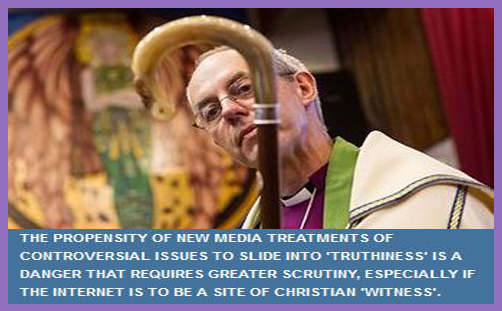 Consider, for example, their coverage of the Archbishop of Canterbury’s visit to the second Global Anglican Future’s Conference in Nairobi, Kenya, in October 2103. Archbishop Justin Welby had been in his post for less than a year, and it was clear that his visit to this conference hosted by the leaders of the Anglican churches of the Global South would be complicated, possibly even contentious. During Anglican Unscripted episode 84, Kallsen and Congar report that the Archbishop of Canterbury’s performance “was a disaster.” However, after George Congar summarised a speech delivered in the Archbishop’s hearing by then Archbishop Peter Jensen (Sydney, Australia), I became rather suspicious about the way the story was being told..
On 3 October 2013, Archbishop Welby was asked during an interview with the Irish Times Gazette to comment on the present relationship between the Anglican Church in North America (ACNA) and the Anglican Communion. The ACNA had formally withdrawn from the Episcopal Church USA, and its status in the Communion remained controversial. Archbishop Welby replied, “Well, the ACNA is a separate church; it is not part of the Anglican Communion.” The interviewer, Canon Ian Ellis, then followed up by asking, “Can it be in communion with the Anglican Communion, or is that something for the future?” The Archbishop answered, “Well, it’s clearly for the future, because it’s not part of the Communion.” He did acknowledge the possibility of reconciliation in the future, but for now the ACNA was only an “ecumenical partner” in the “church of Christ,” rather than a member of the Anglican Communion. And so, once again, Anglican ‘truthiness’ misrepresents Archbishop Justin: “While it is accurate to highlight the contemporary tensions over the question of membership, it is quite another to suggest that Justin Welby was somehow being indiscreet or arrogant to answer the question of the basis of this official list,” Brittain suggests.